Pipeline Coatings Discussion: How Do I Protect and Seal the Lead Wire to Anode Connection? How Do I Protect and Seal the Lead Wire to Anode Connection? Question: I need to find a way to protect and seal the lead wire to anode connection. Do you have something that would work? Heat shrinkable anode caps are perfect for sealing and protecting your anodes. 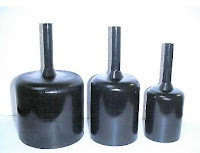 Anode Caps have a long and successful use history. Internally coated with an aggressive mastic sealant, the anode cap successfully creates a barrier to protect water ingress to your lead wire connection. In addition, the anode cap (small end) provides stress relief to that wire to give it a longer life. If you're not using Anode Caps...why not?